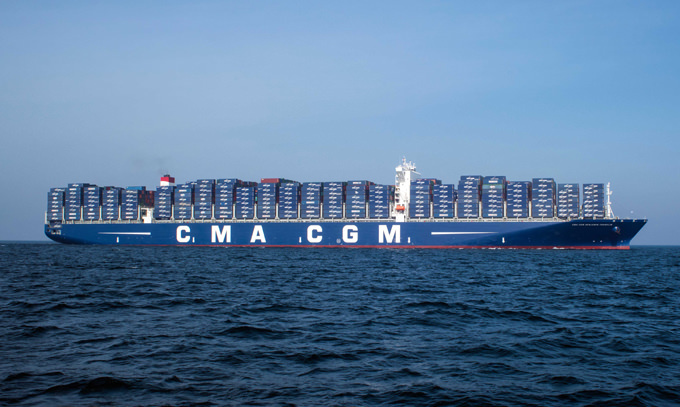 World's largest container ship makes successful calls in U.S. While such megaships have been operational for years, they have only operated between Asia and Europe. The CMA CGM Benjamin Franklin, the first container ship with a carrying capacity of 18,000 twenty-foot equivalent units (TEUs) to call a U.S. port, successfully arrived at the Port of Los Angeles, Cal., in late December. The arrival was hailed as a milestone that port officials said will herald a new era of “megaships” that bring cargo between the West Coast and Asia. With its 18,000 TEU capacity, the Benjamin Franklin carries far more than the 14,000 TEUs of today's “big” ships. The ship made its maiden voyage from Asia, bringing finished products such as beverages, furniture, glassware, plastics, electronics and steel products from China. From Los Angeles, the ship then traveled to Oakland, Cal., for its second U.S. call. On its return, it will export agricultural products like fruit, nuts and meat, as well as wood pulp and cereals, according to port officials. "The momentous arrival of this ship shows how the Port of Los Angeles and our maritime partners are successfully collaborating," said Los Angeles Mayor Eric Garcetti, who visited the ship during its Los Angeles call. "Thank you to our friends at CMA CGM for their partnership, and I look forward to welcoming many more Benjamin Franklin-sized ships as our port continues to grow." Unprecedented measures had to be deployed to handle the berthing of the largest cargo vessel ever to call at a U.S. port. It took years and millions of dollars for Oakland to prepare for the arrival of such giant vessels. Channels to the port had to be dredged to 50 ft., cranes had to be raised to accommodate the ship's height and marine terminals had to been modernized to accommodate the increased import and export volume. While such megaships have been operational for years, they have operated only between Asia and Europe. Even now, few U.S. ports have deep enough channels for the larger vessels traveling from Asia, and East Coast ports are limited by the width of the Panama Canal, port officials said. The CMA CGM Benjamin Franklin is 1,300 ft. long and 177 ft. wide. By comparison, it is longer than the Empire State Building and wider than an American football field. The vessel is 197 ft. high, which is the same height as a 20-floor building. Its highest antenna peaks at 230 ft. The ship can carry up to 18,000 containers, including 1,500 Reefer containers. All containers placed in a line would equal the distance between Santa Monica and Santa Barbara, Cal. Its maximum load capacity represents the volume of 235 Olympic pools, or almost 590,000 cu. m, the company said. The gigantic vessel is also said to be a model for high-energy production. Its 78 ft.-long engine room contains a last-generation engine as powerful as 900 Ford Focus cars, and her thrust of 21 knots is equivalent to 11 Boeing 747-400 engines (3,000 KNewton). The crew of this self-run enterprise comprises 26 members who operate the various facets of the vessel, including its own waste recycling system, chef, swimming pool, etc. From its base in Marseille, France, CMA CGM Group is present in more than 160 countries through its network of more than 655 agencies, with more than 22,000 employees worldwide. With a young and diversified fleet of 470 vessels, CMA CGM Group serves 400 of the world's 521 commercial ports. Through its 170 shipping lines, the company operates on every one of the world's seas. CMA CGM Group posted revenues of $16.7 billion (U.S.) in 2014.